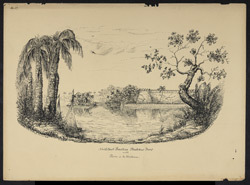 Pen-and-ink drawing of Bukkur Fort and Rohri, Pakistan by Frederic Peter Layard (1818-1891) dated 23rd October 1843. The image is inscribed: 'North East Bastion. Bukkur Fort with Roree in the Distance. Eled(?) on the River Sutledge. Octr. 23 1843. F.P. Layard. Sketd. Suckkur July 1842'. Bukkur Island is a 300 metre wide limestone island in the middle of the Indus River in Sindh province, south-eastern Pakistan. The town of Rohri lies on the west side of the river and the town of Sukker is on the opposite bank. Bukkur contains an ancient mud fortress and many historic tombs and mosques. The island fortress was considered strategically important as the Indus was regarded as an important commercial highway and was seized by the British in the First Anglo-Afghan War (1839-42).